You CAN Play Your Favorite Bluegrass Songs! This book and two CD combo is like having a friend show you all your favorite bluegrass songs. 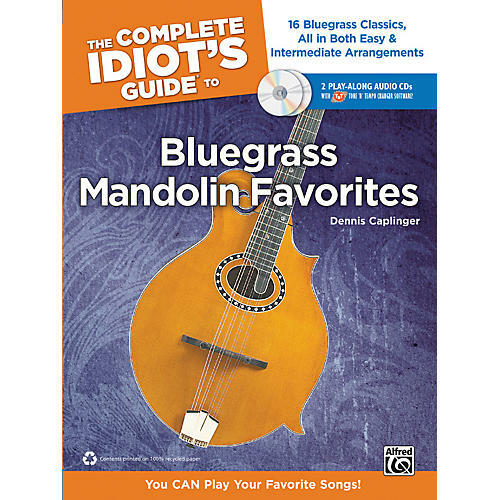 Bluegrass virtuoso Dennis Caplinger teaches you the techniques and concepts you need to start playing some smokin' mandolin right away-all in the context of 16 bluegrass standards. The included CDs feature full explanations of all techniques and songs, and demonstrations of all the music examples. For each song there is a slow tempo demonstration, a complete demo track featuring a world-class bluegrass band, and a complete band track without mandolin for you to play along with. Plus, with the included TNT software, you can slow tracks down, loop sections, and even change keys for ultimate usability. We've even included a short refresher course on music theory, and a mandolin chord dictionary in the back of the book.